The "single dad" is a melodrama and sitcom character that defines its own genre. Plenty of single moms inhabit television as well. But a single mom is expected to already grasp the basics of child rearing, and that pushes the conflict in a different direction. By contrast, regardless of his competence in every other aspect of his life, the single dad is presumed to have a built-in learning curve. Hence the "dumb dad" premise. This plot device has seen an upsurge on Japanese television, in live-action dramas, manga, and anime. • Sweetness & Lightning tackles three genres at once: the single dad, the teacher-student romance, and the cooking show. 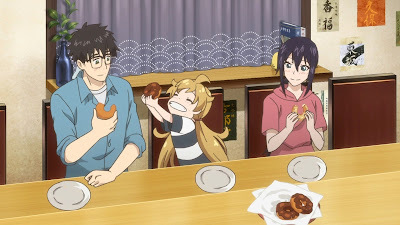 Recently widowed high school teacher Kohei Inuzuka never learned to cook, so he and Tsumugi, his spirited five-year-old daughter, eat takeout almost every meal. Until Kotori Iida, one of his students, hands him a flyer for her family's restaurant. Kotori's (divorced) celebrity chef mom no longer has the time to run it, but Kotori wants a reason to keep the lights on. Realizing that his daughter hasn't eaten a decent home-cooked meal in ages, Kohei takes Kotori up on the offer. The problem is, Kotori doesn't know how to cook either. But with her mother's recipes, the help of Kotori's classmate (whose family runs the local vegetable stand) and Kohei's college friend (a cook), they tackle a new recipe every week. The relationship between Kohei and Kotori is handled so subtly that it can be read as romantic or platonic or something in-between. These dinners quickly become the highlight of the week for all three. The anime is available on Crunchyroll. The English-language manga is published by Kodansha Comics. • Yotsuba&! [sic] is a manga series by Kiyohiko Azuma, now in its twelfth year. Mr. Koiwai adopted Yotsuba abroad (the details are scant). The stories focus around her daily adventures in Japan. Think of Yotsuba as a kindred spirit of Calvin from Calvin and Hobbes. An English translation of the manga is available from Yen Press. Together with the help of his landlord and the landlord's daughter, Mamoru [nicknamed "Marumo"] manages to take care of the twins. They face many challenges, with Marumo struggling to balance his time between his work and parental responsibilities. A cute narrative device is that when Marumo discusses his problems with the family dog, the dog talks back. • Hinamatsuri is based on the manga series by Masao Otake. One day, Hina drops into the condo of yakuza Yoshifumi Nitta through an interdimensional portal. 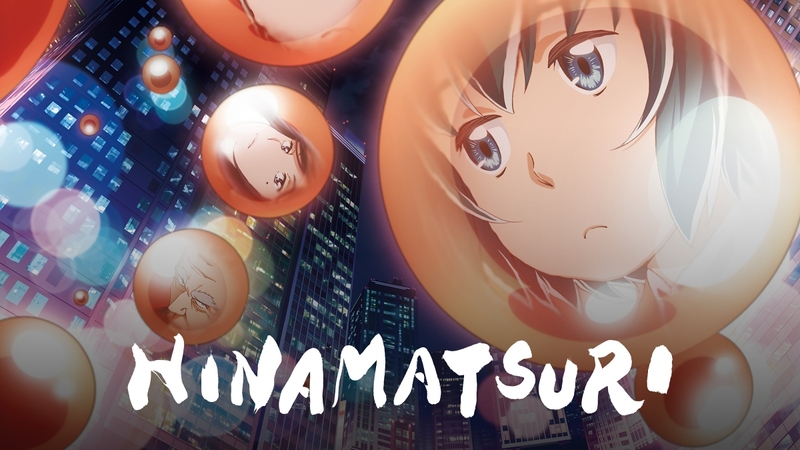 Some sort of bio-engineered child assassin with telekinetic powers, Hina doesn't know what what she's doing there. She assumes she's on a mission and Nitta is her handler. This mistaken assumption comes in handy when Nitta has her literally defenestrate an entire rival gang in one fell swoop. But after that, Nitta is stuck with her. So he tells people that Hina is his long-lost daughter, and before long they have assumed their respective roles. As a brand-new dad, Nitta finds himself with the responsibility of turning this tiny version of Robert Patrick from Terminator 2 into a functioning member of society. The anime is available on Crunchyroll. The English-language manga is published by One Peace Books. Attending the funeral of his ex-girlfriend (who'd been living abroad), Masamune Kazama discovers that not only did she have a child, but she had his child, who now really is his child. What follows is a how-to/day-in-the-life melodrama that defines the next series too. 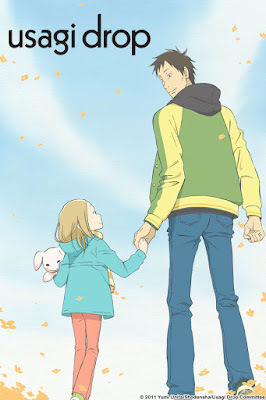 • Bunny Drop is a manga series by Yumi Unita, an anime series by Production I.G, and a 2011 feature film. Daikichi's grandfather had a child with his live-in maid. Daikichi only finds this out at his grandfather's funeral. "If the old man was still alive," he grumbles, "I'd give him a high five." He points out to his mother, "That'd make her your sister." She retorts, "And your aunt." Nobody wants to take responsibility for Rin, the five-year-old girl. Finally (if only out of disgust with the rest of them) Daikichi takes her home. He soon decides to make the arrangement permanent. Bunny Drop is a sweet, unadorned drama that avoids most of the stereotypical melodramatic devices. Like My Girl, it succeeds by making a virtue of ordinariness and by featuring protagonists who are believably decent human beings striving to do the right thing. However clueless Daikichi may be at first, he doesn't stay dumb, and grows quite insightful into the strange, topsy-turvy life Rin has led, while cheerfully saying goodbye to his "me-time" and his climb up the corporate ladder. The anime (based on the first three volumes of the manga; English translation available from Yen Press) is drawn in a pencil-on-watercolor style that gives it a subdued picture book quality. I found it quite pleasant and entirely appropriate to the subject matter. The anime is available on Crunchyroll. The Japanese government actually has a "Minister of State for Measures for the Declining Birthrate." If government agencies were ever that creative, I could imagine them commissioning television series like these to encourage young men to take up the reins of fatherhood. Unfortunately, regardless of the good intentions in the regard, it doesn't seem to be working (in Japan and every other country with the same problem). I enjoyed Bunny Drop very much. I was amused that the manga series skips Rin's early teen years (except through flashbacks). She goes from cute, interesting "little daughter" to teen-deciding-on-the-future in a flash! It seems that once Daikichi has mastered fatherly-ness, no more needs to be said (time for him to master something new).